Stop, moment. Any user of a personal computer can often require a still image display screen. This so-called screenshot. In English the screenshot represents the screen, made on a computer, that is, this image of, that sees the user is currently on the monitor of your computer. How to take a picture of the page? Consider the following. if it is impossible to copy or save the desired material Internet resources, whether text or images. In the first case, you can take a screenshot and contact support or go to any forum, dedicated computer topics, and tell clearly about the problem, thereby speeding up the most accurate and professional in solving the problem council. In the second case, the monitor screen screenshot or rather can "explain" the interface created by the program. Words alone is sometimes not enough for a complete description of the management of the new program features or system being developed. In the third case,, when webmasters make materials inaccessible sites to copy or dynamic web page is a constant change of information, or you need a static image of the film frame, screenshot helps keep the required information. All brilliant - just! So still like to take a picture page of your monitor? Sometimes even advanced users will come to a standstill in the event of such a question. It does not need any sophisticated equipment, nor the easiest camera or camera, and even more special computer skills. The process of removal of a screenshot is fairly easy. It is a matter of minutes making the computer itself when lightly pressed a few keys. look closely at the computer keyboard and find the Print Screen key. It is located in the upper right corner and may be referred to also as the Prnt Scrn. Sometimes, this key is designed to perform several functions, in this case, it will be written more or Print, or SysRg, or shows the printer icon. These functions do not need to remove the screenshot. Press Print Screen. the, that it is now shown on the screen, will be immediately recorded in the computer memory and automatically placed in the clipboard. Extract made a photo of the monitor screen from the clipboard to the desired folder using the program Paint, Word или MO Picture Manager. To do this, open the selected program, select the top menu "File" line, and it – select "Save as ...", and, giving the name of the screenshot, click on the "Save" button. If necessary, edit the resulting image is a screenshot of the screen you paste it into a editing program and make necessary changes. Screenshot, or a photograph of the monitor page, ready. Now it can be sent by email or post to the right resources. Similarly, there is and photographing Internet resource page. But in the beginning you need to enable your browser and press the F11 key, fled to the control panel and the picture turned out without unnecessary elements. How to photograph the page yet? 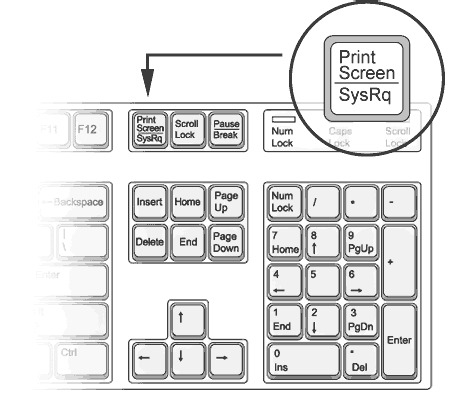 The computer monitor can be removed and with the help of special programs, providing a wide range of functions, but the most accessible, a quick and straightforward method is the use of the Print Screen key.